Email sales@hotsource.tv or call us 021 4478857 to place your order and we will make it happen with our super speedy quotes and our free and friendly local deliveries . If you prefer to pop in and browse you can find us at our very central home base in University Estate – please do call to ensure someone is there. We do take cards on our brilliant Yoco point of sale device here. 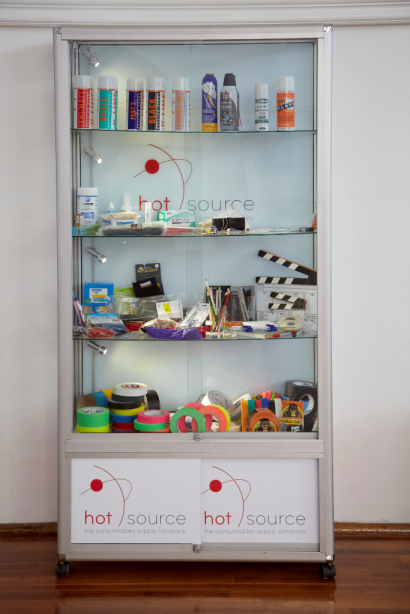 At the awesome state of the art, central Roodebloem Studios is a Hot Source cabinet filled with all the specialised film, technical and day-to-day consumables you might need for your shoot. Just a stones throw from Woodstock Main Rd and with a My City bus stop right on their door step our consumables are now even more convenient to lay your hands on. Gaffer tape, dulling sprays, batteries, stationery, Gorilla tape, bags of bongo ties, glow in the dark tape or even that last minute, oh my gosh we need another hard drive emergency you can now get it all at Roodebloem Studios.